Being a foodie, it always gives me great joy to share food that I love and think deserves credit to the people in my life- my family, friends, and readers like yourself! One of my all-time, all-time favourites that I frequent is Bar B Q Plaza, and when I got invited to do a food review there, I couldn't have been happier and immediately agreed to it! To all the PJ/Klang Valley folks, this entrance must be no stranger to you at all. Yeap, visited the branch at 1 Utama Shopping Center in Petaling Jaya, which is the first ever Bar B Q Plaza outlet in Malaysia! It is located at the Rainforest section of the mall, where a host of other restaurants and eateries are located too. Bar B Q Plaza is a self-cooking Mongolian and Japanese style barbecue restaurant established in 1987 with its first branch at Central Plaza Ladprao, Thailand. In 2005, the first outlet opened its doors at 1 Utama Shopping Center which has quickly grown to many other major shopping centres in Malaysia, and has grown to 48 branches altogether worldwide. Bar B Q plaza is known for its quality of food served but the ultimate hook that gets on every customer is THE SAUCE, and it's FREE FLOW so you can imagine how much sauce I consume every single time I'm there. Almost 3 full bowls of that, cos it's that awesome! #2: RUB THEM PORK FATS! Hahahah I know it sounds funny but I really don't know how to put it other than to 'rub them pork fats'. You'll be given 2 slices of pork fats to rub and spread on the wok to avoid the meat to stick on it later on. This is of utmost importance because you really don't want your meat to stick all over the wok. The ala carte items at Bar B Q Plaza are really nice but the main superstars are the sets! If you don't know what to order, for starters, try the Deluxe Family Set like what we did below! It comes with a mixture of everything! You get fresh slices of chicken, fish fillet, salmon, sirloin, choice beef, pork, bacon, Australian lamb, squid, shrimp, jelly fish, along with vegetables such as green tea taufu, fish mushrooms, baby corn, carrots, lettuce, tomatoes, pumpkins, broccoli, Chinese mushrooms, you mak, bean curd and my favourite- sliced cabbages! Oh yeah, don't forget to drink the soup! It'll be super yummers especially after boiling it with veggies and meat. The meal wouldn't be complete without its signature garlic rice! 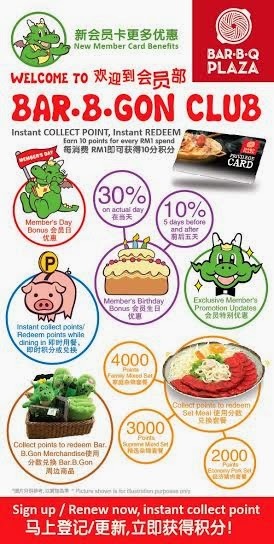 Just add a minimal amount of around RM1.50 to upgrade from their complimentary steam rice to the signature garlic rice, which is aromatic and really yummy! Highly recommended. The side Bar B Q items were prepared to complement the main dishes themselves. Fried Bacon Roll - MY FAVOURITE! Their sauce for this dish is LOVE. Sweet Corn Bacon Salad - Niceeeeeee! Bar B Q Plaza seriously has got to be one of the restaurants with the widest choices for beverages! From Chinese Tea, Green Tea, Herbal Teas, to Ice Blended, Soda and Soft Drinks, Special Float Drinks, beers coffee and the likes. Something for everyone. I had Ribenna Soda and it was yumssss. Being a Bar B Q Plaza fan myself, I couldn't contain my excitement but to indulge in all of them that evening. All my favourite stuff....how to resist! In the end we really wiped everything clean. Too yummy. Sharon and I were stuffed by the end of the meal, but super satisfied. Oh, here are some of the special offers and promotions that you might want to look out for! Sign up as a BAR B GON club member and enjoy the perks as listed above! I remember I used to take advantage of my status as a student back then when I was still studying, and always get special discounts and perks while dining at Bar B Q Plaza. Now I can't anymore but if you're a student, don't miss these perks! Student Privilege: 20% off sets and RM12.90 for express lunch! So super worth it! Another yummy meal at Bar B Q Plaza, as always. Thanks for having me that evening! For those of you who are keen to pay Bar B Q Plaza a visit, you can go to www.barbqplaza.com.my to find out everything you need to know about the restaurant, from the menu, special promotions, to all the outlet locations in Malaysia.